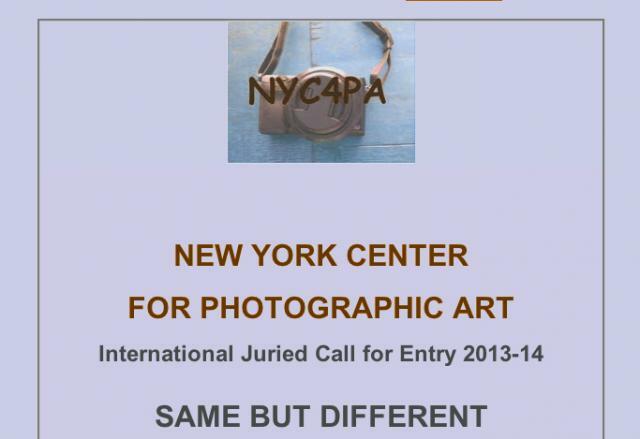 The New York Center for Photographic Art (NYC4PA) invites photographers world-wide to submit images using any photographic process (print, image transfer, emulsion transfer, encaustic, black and white, color, etc.). Winners will receive over $5,000 in cash awards and be featured on the NYC4PA Online Gallery, and in the SAME BUT DIFFERENT exhibition catalog. The Grand Prize winning image will be posted on the NYC4PA home page.